Here are 6 ways to show expression of gratitude and respect for those who paid the ultimate price for our freedoms, but also show support for the men and women who are currently fighting to keep our country safe. 1) Fly the US flag at half-staff until noon. The correct procedure for displaying the flag at half-staff is to raise the flag to the top of the pole briskly, pause for a moment, and then slowly bring it down to where the top of the flag is at a position approximately halfway between the top and bottom of the pole. At noon, the flag should be raised to the top of the flag pole. At the end of the day, the flag should be lowered slowly and ceremoniously for the day. 2) Fly the “POW/MIA” flag as well once it is at full staff. 3) Visit cemeteries and place flags or flowers on the graves of our fallen heroes. 4) Visit memorials and take part in services sponsored by veterans. of others in defense of our nation. Custom Flag Company is a proud member of FMAA, Flag Manufacturing Association of America, who is dedicated to education and promoting the quality and proper use of flags. We support FMAA and their want for all USA flags to be completely created by products in USA and by proud Americans. Posted on May 24, 2018 by Andrea Griebling and filed under Flag Facts, Holiday, US Flag and tagged Memorial Day. Last Day to Order Custom Flag before Christmas without RUSH! 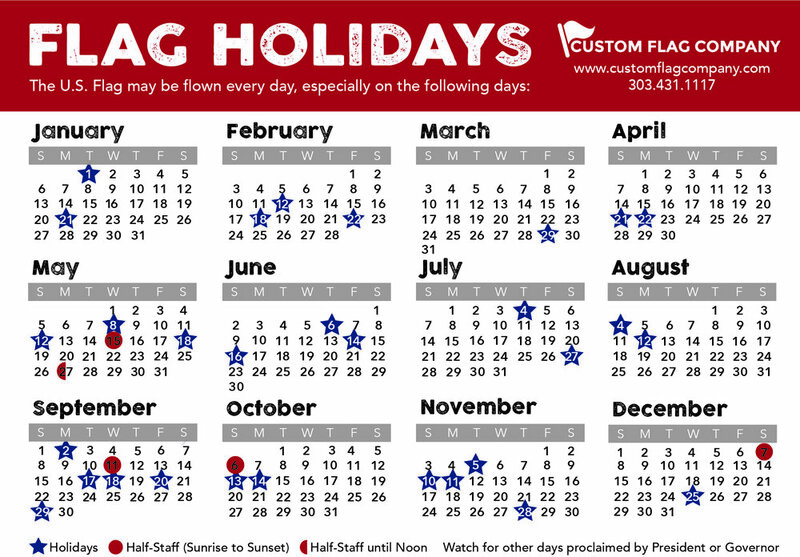 Today marks the LAST day to order a custom flag to be delivered BEFORE Christmas WITHOUT a RUSH. Get your idea together and contact us for the perfect give for your loved one. Call us @ 303-431-1117 or CLICK HERE for an online quote. Posted on December 8, 2016 by Kim Griebling and filed under Custom Flags, Holiday. Custom Flag Company is a donation drop off location for the Marine Corps Reserve Toys for Tots. Drop off a new, unwrapped toy anytime during business hours. The toys will be picked up on December 16. Posted on December 2, 2016 by Kim Griebling and filed under Events, Holiday, Misc-. Being a small family owned & operated business, we take full advantage of our flexibility and offer you a week-long celebration of Black Friday, Small Business Saturday, AND Cyber Monday with just one simple coupon code: 2016SALE ! We are offering THREE products included in our annual 3 in 1 Sale. Custom flags require special attention and cannot be purchased directly online. Give us a call at 303-431-1117, send an email, or submit your artwork online and we'll be happy to bring your vision to life! Please be sure to mention the 3-IN-1-SALE and be advised that our office will be closed Thursday through Sunday, returning Monday, November 28, 2016 at which time we will process your request. Thank you! Posted on November 22, 2016 by Kim Griebling and filed under Custom Flags, Holiday, State Flags, US Flag.